Recent news shows aerial drone delivery of small packages from an Amazon Warehouse or pizza from the nearest Dominos, but such packages are lightweight trifles compared to the 700 pounds Chip Yates promises to drop from the sky. Such loads are necessary in conflict and disaster areas, where material heavy enough to hold off an enemy or feed hordes of refugees is essential. Fifty-kilogram sacks of rice or electric generators are necessary for survival, and a heavy-duty delivery system will almost always come in handy. 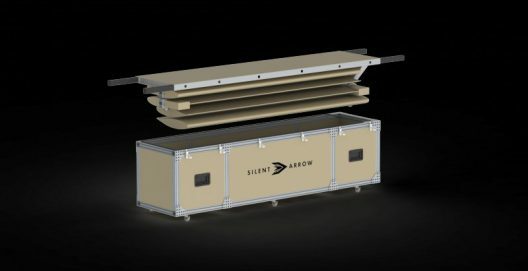 It’s the Silent Arrow, delivered in its own box, which becomes the fuselage for the pointy-nosed delivery drone. Designed to be dropped from large aircraft such as the CH-53K, MV-22, or C-130, the GD-700 looks a great deal like a military container, or the heavy-duty sound systems lugged about by rock group roadies. The wings are folded lengthwise in the box as delivered to its user, who merely has to release a series of catches, pull the top up and flip it over to reveal the tandem wings which can flip into flight positions after the newly refilled container is dropped out of a delivery plane. Unlike parachute deliveries, in which the ship carrying supplies must be flown precariously close to a battle or disaster zone, the delivery craft can “stand off” at a distance (23 to 49 miles) at an altitude of 12,000 to 25,000 feet, safe from shoulder-fired missiles or ugly weather or terrain. When the GD-700 leaves the mother ship, its wings flip out and it can be guided to a landing zone, where it alights with loss drama than it would if coming straight down in a parachute. A motorized version will enable release at even greater distances from the target, giving a higher degree of safety to the flight crew. Where the unpowered version is seen as disposable, the electrically-powered ER-700 can be reused. 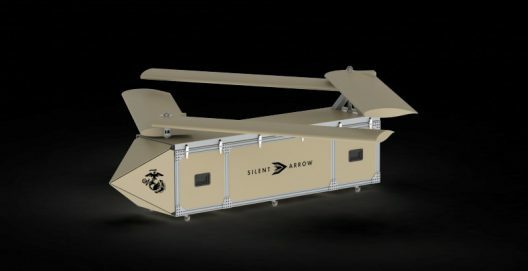 At about $10,000 for the unpowered version, even a one-time use makes for inexpensive delivery of necessary supplies in hazardous situations. There is no official word on the powerplant for the ER-700, or what additional costs will apply. Yates Electrospace is currently working to fulfill an initial order for 10 GD-700s, six of which are undergoing wing-deployment testing with the U. S. Marine Corps Warfighting Laboratory (MCWL) in preparation for full flight tests. Not content for mere 200 mph speeds with the Long-ESA, Chip is developing a VFP (Very Fast Plane) intended to push the electric speed record into the 400 mph range – or beyond. Chip says the airplane “Looks like a bullet,” and will have four UQM 250-kilowatt (335-horsepower) motors driving propellers (note the plural) from Craig Catto. 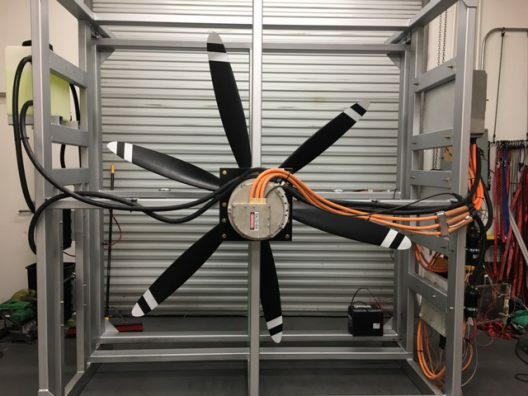 According to Aviation Week, two of the new motors have been tested on a custom test stand, driving contra-rotating props “with good results.” With all four motors running, the VFP will be the first megawatt electric airplane, according to Chip. This is possibly the test stand on which motor and propeller testing for Jeffrey Engler’s airliner project has taken place. Regardless, Chip Yates is not content to let laurels rest easily on his brow, preferring to constantly challenge even his own best efforts. Previous post: Zee? Kitty Hawk? Cora?